tautech, beanflying, bsdphk, Neonuros, BravoV, neo and 21 Guests are viewing this topic. Lucky you. I got a B in my German O-level. I don't stand a chance these days. That's very unusual, normally they just have a superiority attitude....who me, you can't be talking to me in that tone. Most cats can be trained to some degree, our current one that loves climbing onto any higher place now has boundaries on what's allowed and what's not. A few months of launching soft missiles at her (cushions, pillows, baseball caps etc) accompanied with the command 'get down' in a gruff voice has got the message through. Now anytime she steps out of bounds 'get down' has her heading for the door to escape an expected barrage of missiles. This cat is special, he is half bobcat to begin with and (i think) as a side effect to that he has significantly diminished mental capability. In short he is big, he is dumb and he most certainly does not intend to learn (if he is even capable of learning) but at least he loves me. The problem comes in the form of cats because the second i leave my bench they yank the stand off and no matter what i do they don't stop. You just gave me an amazing idea. I used tape to secure the cord in such a fashion that it still moves rather freely without hanging a "Play with me!" sign on it. Lets see how long it takes either the big idiot to ruin this idea or for me to want a better system. I hope, this includes only the holder, not the flat iron. Ah, nice to see the rubidium reference working properly! Wouldn't expect those old counters to be so accurate. Are those equipped with OCXOs? I'm not a nixie fanboy at all but nice glowing, by the way; Like a warm fireplace in the winter. The design of those counters is delicious. Not to be compared to modern plasticky stuff (even if it's only a printed plastic foil covering the front panel). But as I'm sticking to HP-IB/GPIB equipped instruments those pieces of gorgeous design will most unlikely hit my desk. Have to warm me (in my thoughts) with such fotos. Wow, this thread certainly has been active lately. It’s good to see all these admitted addictions out in the open. I take comfort in knowing that I’m not alone and not crazy. Well, maybe a little nuts. But aren’t we all? My addiction as of late has been vintage Fluke bench DMM’s. 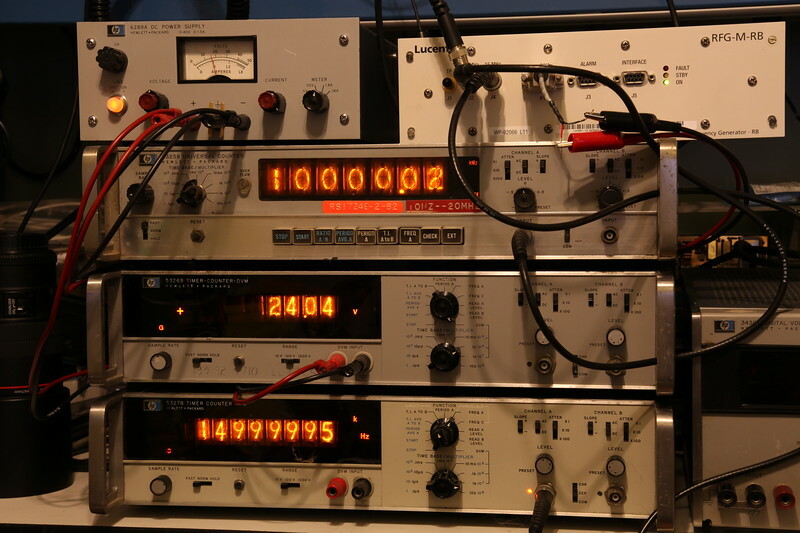 The following now grace my bench: 8000A, 8010A, 8050A, and 8600A. All E-bay purchases. Some required repair to get them working while others just needed some cleaning and touch up. All of them are now functional. And I did some basic calibration to make them useful. But my desire was to get all my DMM’s accurately calibrated and do it without breaking the bank. As you know even surplus calibrators/references tend to be quite pricy. I do have a DC voltage reference I built years ago that is fairly accurate and does a good job in checking 3.5 digit DMM’s. But I knew it was not suitable for 4.5 digit DMM’s. So a few months ago I purchased an AD-584-M voltage reference. And then a few weeks ago purchased a 2nd one as a backup and a sanity check. I am quite pleased with their accuracy and stability. For checking ohms I built up a switch box with .1% resistors ranging from 1 ohm to 10MEG. Some DMM’s require a 190VDC reference for calibration so I used a Smakn DC-DC Converter. Unfortunately it’s not very stable so I can’t achieve as accurate results as I’d like. AC volts is a real challenge. I do have a 1.0VAC reference of unknown accuracy. That’s all I have. And most DMM’s require various voltages/frequencies for calibration. So for now I’ve chosen not to bother with AC volts other than making sure the DMM works on that function. So what are the results? I recently spent almost an entire weekend carefully measuring and tweaking. The attached chart tells the story. Everything fell into spec except for one item. For some reason the Tek 2465 DMM will not set any higher than 9.993M with a 10.0M calibration constant. I suspect it’s due to the issues the scope is having with the Buffer Board EAROM where the calibration data is stored. But overall I’m happy and I plan on doing yearly full calibrations and occasional spot checking. And now maybe it’s time to branch out a bit. Been thinking of going after Keithley DMM’s such as a 179. After all, I have room on the chart! I've got a mouser account now..! Three different connectors, 2x Lemo, 1x Triax BNC 3-lug - over 130€. Huuhh. Big warning when you’re getting the old one out: getting all the legs cleanly desoldered is a pain. I actually tend to pull the top off the switch, extract the innards, Dremel most of it off, then desolder the legs individually and clean up the holes with chemtronics soder wick. This was after I ruined a board getting one off with a pump years ago. You have got to get yourself one of these desoldering stations guns, meter stripped down, old switch photographed, desoldered top and bottom, interlock mechanism removed, switch removed, new switch had to have some bottom terminals cut off as these were connected on top so no provision was made for the pins on PCB. New switched soldered to PCB, connections remade on top, interlocking reassembled, PCB screwed back into meter along with other parts and display, battery plugged in tested, all done and fully working inside 30 minutes and not a Dremel or solder wick in sight. Seriously I would consider one of these vacuum pump desoldering stations a must, makes repair work and also of parts harvesting so much easier and quicker and parts are removed in a clean state ready for reuse straight away. I’ve just paid of my GW Instek meter this morning thanks to some eBay sales (not test gear!) so I’m looking at this over the next few days. Looking like the weller TCP is going in favour of a Hakko 888 and a separate Aoyue desoldering station. That's what he wants you to think. If you follow the above advice, one day he is going to swan in to interfere with your workbench wearing a little kitty raincoat and a pair of little kitty ear defenders. You're going to look at him and your jaw is going to drop, and then the cat is going to give you a look that says "Who's stupid now?". Slightly off topic: I lost 1/2 of yesterday to a cat. The other half came in from doing some weeding in the back garden carrying a four week old black kitten with deep blue eyes she found huddled up by the house. It was too small and weak to have got there itself, mum was nowhere to be found, neither were any other kittens and door-to-door enquiries of the neighbours turned up nothing. So we arranged for the RSPCA to come and rescue him/her. This meant that I had to spend the next 2 1/2 hours sitting with Dr. Tinycat curled up in the crook of my elbow to keep warm while I waited for the RSPCA to arrive. No further work was achieved, but a lot of "OH, you're so cute" was. I think we've found what awesome14 uses to solder his D-105 voltage references with! The water bottle is the way to go most cats hate to get wet. (I had two that loved the water) A good Squirt will provide a reason to leave the cord alone. They reward said cat by providing something in the room that hangs he or she can play with. The carrot and stick works well most of the time. Since this thread has completely drifted away from its starting point, and is going down the hill taken by the entire internet towards cute cat videos, I might as well ask whether anybody remembers the early 80s book "101 uses of a dead cat". Cool. Hope that works out for the long term. Otherwise, you might try Sue's suggestion and provide an even-more-tantalizing toy as a diversion. 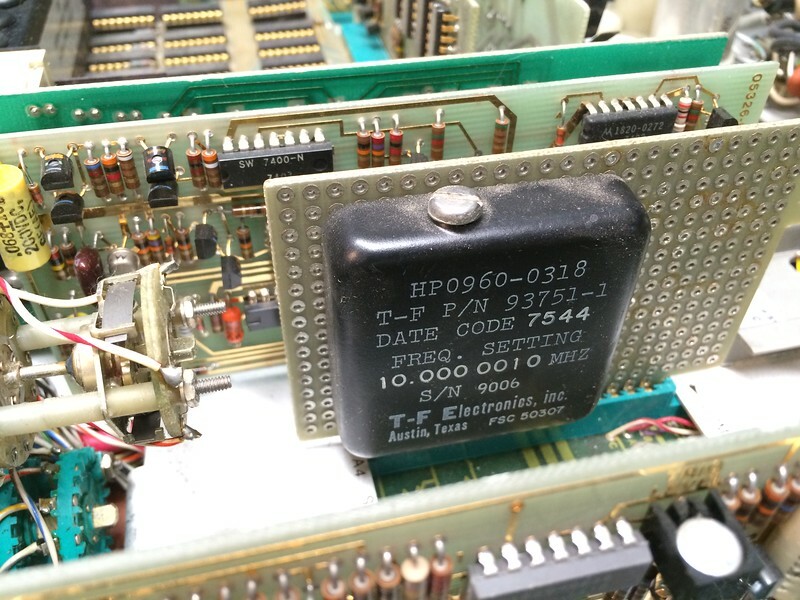 But as I'm sticking to HP-IB/GPIB equipped instruments those pieces of gorgeous design will most unlikely hit my desk. I don't recall which exact models have "printer" ports on the back, but one could utilize a microcontroller to bridge the vintage parallel output to GPIB, USB, Ethernet, Wi-Fi, etc. Might be a fun project. Yes, and it's good to see you back here in the pile of nuts. You've been having quite the adventure with those Flukes. Beware of the Keithleys: The prices on them are often — most of the time — nuts, which makes them fun and challenging to acquire. Over time, I got a little brown set together: 196 DMM, 220 current source, 228 voltage source/sink. Excellent. I like their project manager for organizing and sharing parts lists. After 118 pages, I suppose a tangent was bound to happen. One could say it's like herding cats. I vaguely remember, but am pretty sure I haven't read, that "101" book. Are dead cats useful for TEA or other things in the lab? They're rather poor anti-static mats. There is a copy in the garage in the box with the RCA Receiving tube manual and a couple of old ARRL Handbooks. The 5325B is not, but I just popped the cover off of the 5327B and discovered that it has a TCXO in it. It's on a vectorboard edge card, but may well be custom from HP - the unit has a non-standard serial number (SC-94), so my guess is that it's built to some customer's specification. The date codes on the parts are in the same ballpark at least. My cat comments are entirely TEA related, in preservation of equipment. Water bottle might not work because he actually doesn't mind water even if i could catch him in the act and trust me he really is as dumb as i make him sound. So many nixies, ebay is calling and my wallet is aching. MUST. AVOID. EBAY. Great counters and pictures thereof Pat. One more cat related story and I'll let it go. My cat (the one in my avatar) when she was alive would not stop chewing on the cord for my Weller TC series soldering station. Something about soft silicon Teflon, must be like chewy rat. I could not get her to stop chewing on the handpiece cord. One day she just quit. I figure she found it would bite back, I guess 24VAC is not so tasty. Weller makes good cords, that cord lasted until just over a year ago. Anyone who ever has owned one of these stations for a long time knows the cord goes open at the strain relief; that is what finally did this one in. $99.00 later a new handpiece and the old one is safely stored away as a memory to my kitty who has gone to prepare a place for us in the afterlife. /We now return you to our regularly scheduled program. ... I just popped the cover off of the 5327B and discovered that it has a TCXO in it. It's on a vectorboard edge card, but may well be custom from HP - the unit has a non-standard serial number (SC-94), so my guess is that it's built to some customer's specification. The date codes on the parts are in the same ballpark at least. That's an interesting frequency setting. 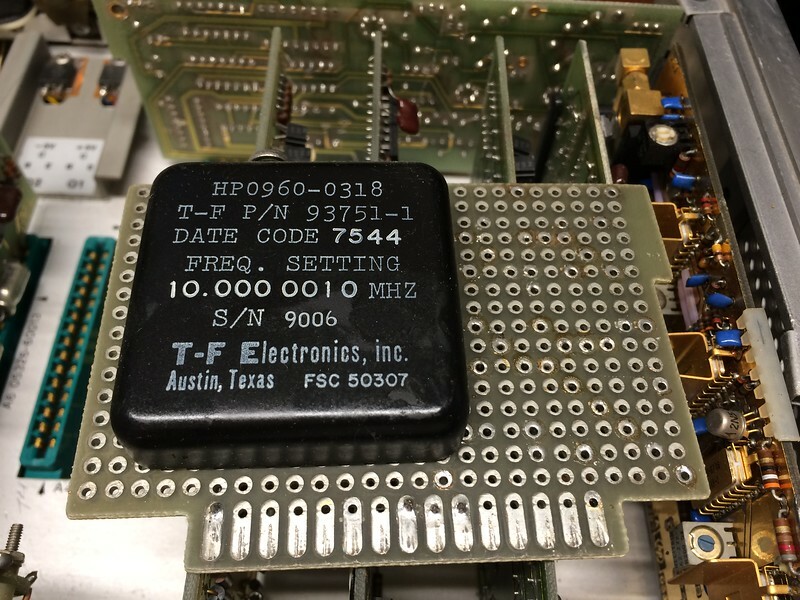 "Yeah, can you make us a special 10 MHz TCXO? Set it 1.0 Hz high, please." With my new (to me) scope (Tektronix 7704A) does it require probes built special for it or will common probes work?